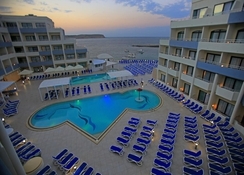 Labranda Riviera Hotel and Spa is located in a very quiet and picturesque part of Malta. 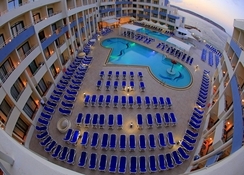 It has 353 rooms, most with views of the Mediterranean Sea. All of them have air conditioning and heating, television, telephone and safe. If you want to enjoy a nice meal or dinner you can do it in one of the restaurants, bars and cafe lounge that the hotel offers. You can also spend time relaxing in the onsite spa. If you have to celebrate an important event such as meetings or banquets the hotel puts at your disposal several rooms specially prepared for it. 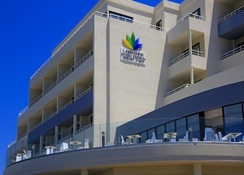 Labranda Riviera Hotel and Spa is located in one of the most picturesque and charming areas of northern Malta, facing the channel that separates it from the islands of Gozo and Comino. The complex offers total relaxation with its wonderful and tranquil location, with incredible views of the coast and the sea. A public bus service connects the complex with the most important sites. Mellieha Bay, has the largest beach on the island. The ferry terminal for Gozo is 1km away where there are also boats that leave for the Blue Lagoon from the dock only in summer. The Malta International Airport is 27km from the property. 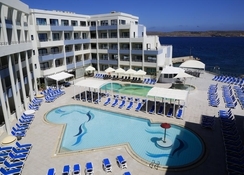 Labranda Riviera Hotel and Spa offers 353 comfortable and luxurious fully furnished rooms overlooking the sea or the landscape, also available superior rooms and suites, from which you can also enjoy wonderful views of the Mediterranean Sea and the islands of Comino and Gozo. All rooms have air conditioning and central heating, satellite television, minibar, telephone with direct line, safe, USB port connections, and bathroom en-suite complete and equipped with hair dryer. The hotel offers a selection of rooms available to meet the needs of guests, special requirements for those traveling on business, or simply for pleasure. Rooms for non-smokers, and others adapted for people with reduced mobility are also available, along with interconnected rooms for families. 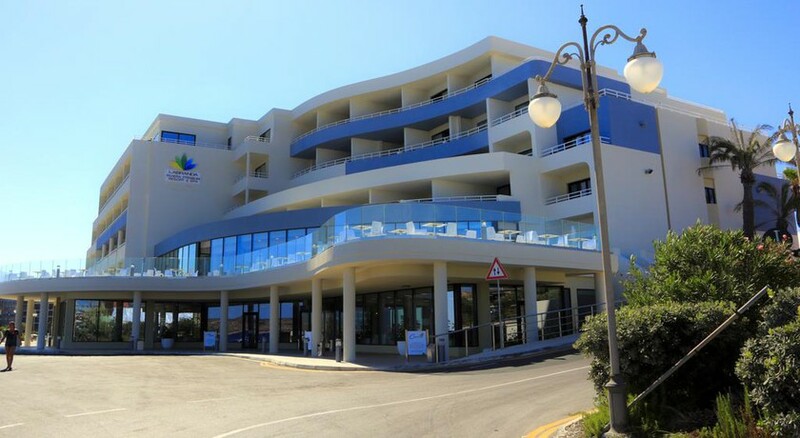 The stay at Labranda Riviera Hotel and Spa is offered with an all-inclusive breakfast, lunch and dinner, which is served in the buffet restaurant. Next to this is an a la carte restaurant / bistro. During the day, the hotel looks forward to welcoming you to the pool bar and the café, where snacks and drinks are served. In the evening, guests can relax with a sundowner at the cocktail bar. The Spa offers a wide range of Thalassotherapy treatments, with programs adapted to each individual. The spa is specifically inclined to wellness, where fitness, beauty and relaxation are in harmony to achieve a balance between body and mind. It offers massage treatments, aromatherapy, lymphatic massages and reflexology. The hotel also offers a heated indoor pool, a separate Jacuzzi, dry saunas and steam baths, along with other hydrotherapy facilities such as Vichy treatments, Body Blitz, hydromassage bed and tubes, all with the benefit of seawater. The sauna is available only at certain times of the day. Stayed here for a weekend break with my girlfriend and had a great time, good transport links and easy access to the other islands. Would definitely recommend.